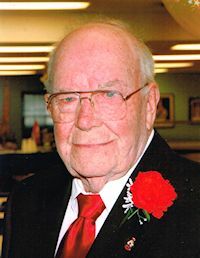 "Ab" Alvin John Ward, of Wiarton, peacefully surrounded by his loving family at Gateway Haven, Wiarton, on Wednesday January 21, 2015 in his 104th year. Proud father of Wayne Ward and his wife Anne, of Wiarton, Ruth and her husband Milt Casemore, of Owen Sound, Grace Mackie, of Lion’s Head, Norma and her husband Jack Campbell, and Linda Barfoot and her friend John Good, all of Wiarton. Cherished grandfather of Keith Ward, Bruce Ward, Mary-Lou Whitcroft, Gary Casemore, Fran Brown, Greg Casemore, Jerry Mackie, Brad Mackie, Joanne Burt, Julie Ellis, Troy Barfoot, and Chris Barfoot; great-grandfather of 26; and great-great-grandfather of 5. Brother-in-law of Betty Ward; and sadly missed by his many nieces and nephews. Predeceased by his parents Alfred and Minnie (nee Wrigley); wife Hazel (nee Watchorn) in 1991; son Wray Ward; daughter Jean Ward; brothers and sisters, Rita Porter, Mervin, Jim, Aleda Porter, Charlie, Art, Marie Hambly, and Lawrence; and sons-in-law Larry Barfoot (2012), and Clayton Mackie (2015). Special friend of the late Bernice Laird, and her daughters Roberta and Mary Jane. Ab will forever be remembered as a quiet, hard-working man who devoted his life to his family. Family invite you to gather with them at the Thomas C. Whitcroft Peninsula Chapel, 272 Berford St., Wiarton (519) 534-5341 on Saturday, January 24, 2015 from 1-4 PM, where a service to celebrate Ab’s long and interesting life will be conducted in the chapel on Sunday at 2 o’clock. Spring interment in Bayview Cemetery, Wiarton. Donations to Friends of Gateway would be appreciated.